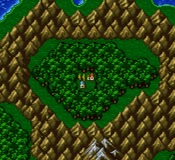 This hamlet nestled in a ring of mountains is the birthplace of our hero Bartz. It’s no wonder then that the town melody is entitled My Home Sweet Home. There is a lovely version of the song on the Final Fantasy 1987-1994 collection, the same one on Final Fantasy V Dear Friends. But I digress. You’re here to learn more about the game, not its soundtrack. I don’t know why they even call this place a magic shop. The guy doesn’t even have a counter. He sells one spell that might come in handy if you flubbed the escape from Karnak Castle: Esuna. If you’re running low on anything, buy it now. This item shop sells everything at a 50% discount just because your Dad was a swell guy. The shop also introduces the wonderful Ether, which restores up to 40 mp to its target. It is a fabulous (and usually pricey) way to keep casting those spells during long drawn out battles. If only the weapon shop sold Shurikens for 50% off. This is the first town that sells throwing weapons. Shurikens are wonderful, but for 2,500 Gil each they are too expensive to use often. The scrolls are cheaper, and since they inflict elemental damage they can be just as effective if you use them against the right enemies. Pick up a few Flame and Water scrolls. You can easily get Thunder scrolls from Thunder Anemones in the ocean…or you could before your ship sank. The armorist rather lacks wares. He sells only one helmet—the Green Beret, and one robe—the Ninja Suit. These are both excellent lightweight items for your party members. But this isn’t the first or last time you’ll see them. If you’re short on cash (from saving up for the relics in Istory), just bide your time. Better armor will come your way. Bartz’s old house still stands. The blue-haired bard invites you to look around. You might notice a bright pink object setting on a shelf in the northeast corner of the house. This is a music box, and will take Bartz back to his past, and the last time he saw his mother and father together. After reminiscing, speak to the bard again. He teaches you Alluring Air. Don't forget to talk to Bartz old friend, that one guy in the middle of the town, whose reminiscing cues a cut scene with little Bartz getting traumatized. You get to see why he now has a fear of heights. Listen to the music box and then speak to the bard.